The Wolverines are favored, but the WhatIfSports.com simulation engine likes Michigan State to prevail on Saturday. It was another successful week of picks by our computers. In the past two weeks, the predictions are 7-2 with the upsets. Overall, our sim engine is picking 83.2 percent winners (337-68) and 84.3 percent when it comes to Top 25 matchups (118-22). According to the simulation machine, the Spartans were projected to win by an average score of 31.3-28.5. It took some OT, but San Jose State was a 33-27 winner over the Rebels. 3-0. That’s it. Other than a game-winning safety, this is the lowest scoring outcome possible in an NCAA game. Our computers had the Eagles winning 61.4 percent of the simulations. Unfortunately, there were no winners in this one. One team continued its winning streak while the other had its streak snapped in the last contest. Stanford’s stumble against Northwestern in Week 1 was once thought of as a bad loss. Not anymore. The Wildcats are 5-1 and the Cardinal has won four straight since that game. Also, it’s not that Stanford is winning, but it’s how much they are producing. David Shaw’s squad is scoring an average of 42.3 points in their last four games. The Bruins had a week off after Arizona State went into Pasadena and gave UCLA its first loss of the season. If the Bruins want to keep up with Utah, they can’t afford to drop another game in the Pac-12. Unfortunately for UCLA, the simulation engine predicts that Stanford will win. The Cardinal won 51.9 percent of the results by an average score of 29.1-28.9. The Hawkeyes currently lead the Big 10 West region by one game over the Wildcats. Northwestern was shut out in Week 6 at Ann Arbor, 38-0. Iowa remains undefeated after its nine-point win against Illinois, 29-20. If it wasn’t for a late field goal by Marshall Koehn, Iowa would’ve won three of its six games by six points or less. While the Wildcats haven’t lost a game at home since November of 2014, Iowa already has a big win on the road this season (10-6 win in Wisconsin). Plus, in last year’s matchup, Iowa embarrassed Northwestern, 48-7. Mark Weisman scored three touchdowns in that game. Jordan Canzeri will look to do the same. And, our computers believe in Iowa. The Hawkeyes won 55.2 percent of the 101 simulations by an average score of 25.6-24.1. The "little brother" (MSU) has gotten the best of the "big brother" (UM) in six of the past seven games. However, the Spartans have not looked impressive in their most recent victories. Two weeks ago, they survived a late rally and won 24-21 against Purdue. Last week, it took a last-minute touchdown by LJ Scott to earn the 31-24 victory at Rutgers. Those two teams are a combined 3-8 and are winless in Big Ten conference play. As for the Wolverines, they seem to get better in each game. After an opening week loss to still-undefeated Utah, Michigan has allowed only 14 total points in five games. No one has scored on Michigan in the past three games. Surprisingly, the computers still like the Spartans’ chances. Michigan State won 53.5 percent of the sims with an average score of 26.1-23.7. And now, we come to the SEC portion of the Top 25 matchups. If Alabama wants a shot at winning its fourth straight SEC West crown, then it needs to win-out. The Aggies have yet to win the SEC or even their division. However, they are off to a great start in 2015. Texas A&M is 5-0 and will play its sixth straight home (or neutral site) game this Saturday. The Crimson Tide are led by junior running back Derrick Henry. His 665 rushing yards are tied with Utah’s Devontae Booker at 15th in the nation. In order for Alabama to make the big plays on offense, it will need to find a way to stop A&M’s Myles Garrett. The sophomore defensive lineman is tied for fourth in the nation with 7.5 sacks in 2015. The computers like Alabama in a close one. Nick Saban’s boys won 54.7 percent of the sims with an average score of 28.4-27.4. Arguably the biggest game of the week will be played in Death Valley. The current leaders of each SEC division will square off in a possible preview for the SEC title. The Tigers are led by sophomore Leonard Fournette. His 1,022 rushing yards are 148 yards more than the player in second place…and Fournette has played in one less game. The Gators pride themselves with defense. Florida has held three of its last four opponents to 10 points or less. Last year, LSU went into The Swamp and won 30-27 after Colby Delahoussaye made a 50-yard field goal with three seconds left in the game. Fournette rushed for 140 yards and two touchdowns in the win. Our sim engine thinks the Tigers will remain undefeated, as LSU won 54.6 percent of the results with an average score of 26.0-24.9 over Florida. The Wildcats have defeated the Tigers once in the past 17 meetings. That lone win came in 2009 at Auburn. This season, both teams have been surprises, but in different varieties. Kentucky is in second place in the SEC East and barely lost to the leader, Florida (14-9). Auburn was predicted to make a run for national title. However, its 0-2 start in the SEC will make that task nearly impossible. Both teams took a week off, but it looks like our computers favor those in Lexington. After 101 simulations, our computers predict a Kentucky win in 51.9 percent of the matchups with an average score of 27.5-26.9. In addition, view our Week 7 power rankings or visit our college football archive for predictions from past weeks. 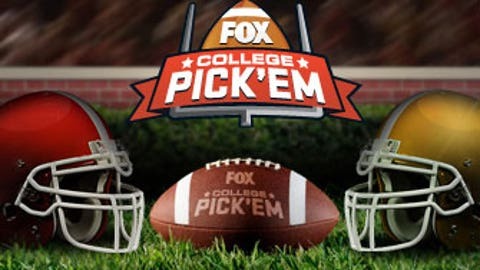 For more statistics, view our weekly college football predictions.